Organists : Adam Dickson, Lee Dunleavy, Nathan Lam, Stephen Meakins and Roger Palmer. 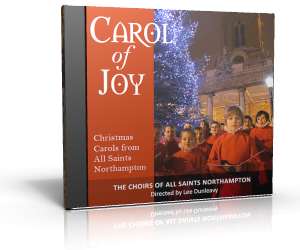 CAROL OF JOY is the third Christmas disc (following THE BETHLEHEM STAR and CHRISTMAS CAROLS FROM ALL SAINTS) from the Choirs of All Saints’ Northampton, and features twenty-one popular and original carols. Of particular interest are the carols that are commonly sung congregationally, which are performed in the less well-known versions not to be found in volumes of Carols for Choirs! We continue our association with Adrian Self, and record commissioned carols by Sir Richard Rodney Bennett, Barry Ferguson, and our own Director of Music, Lee Dunleavy. The title track is a new American carol by the up-and-coming composer Dan Forrest, which is sure to delight carol services in the coming years. The booklet that accompanies the disc includes comprehensive notes on the works performed and the artists featured, and full texts and translations can be downloaded here. We were delighted to record once again in the wonderful acoustics of St Mary’s Church in Wellingborough, where their Hill Organ (specification). # items marked with an hash were commissioned by or arranged for the choir.